How Much Of My Demand Generation Budget Should I Be Spending On Lead Nurturing? How much of our total demand generation budget should we spend on generating net new leads, and how much should we spend on converting the leads we have? The fact that B2B marketers are even asking this question shows how far demand generation thinking has progressed. 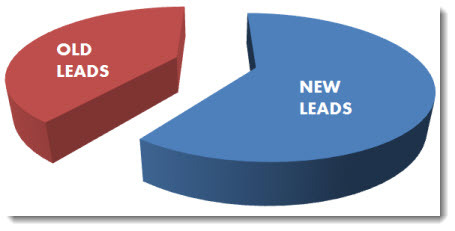 No longer does demand generation rely in total on the acquisition of net new prospects; companies now realize that the most efficient way to acquire warm leads, leads that can ultimately become opportunities and then deals, is to cultivate the cold leads that already exist in their database. Let’s repeat that for emphasis: it’s cheaper to generate warm leads through lead nurturing (converting the leads you have) than it is to go and acquire those same leads from scratch. Company A is a 5-year old software company marketing a solution to a very finite market – large financial institutions. Through demand generation and list acquisition, the company has built a database that comprises 90 percent of the key decision-makers and influencers within these target accounts. Can a firm like this rely 100% on lead nurturing? In short: no. One, because they need to be able to reach the other 10% of their target market if and when those people have a need, but also because no lead nurturing program is perfect, and so they can’t depend with certainty on any known lead to automatically contact the company simply because he or she has been receiving emails for the last two years. A good budget mix in this situation might be 80% lead nurturing, 20% lead generation. Company B is a start-up with little market awareness and no database, and is just starting to build out its sales team. Their decision is more obvious – they need to dedicate most of their investment to pure lead generation in order to build a database of a size sufficient to ultimately support the sales team. In this scenario, a practical budget mix might be 80% lead generation, 20% lead nurturing, the opposite of Company A. But what if your company, like most, is somewhere in the middle? What if you have a reasonably sized database but not one large enough to sustain the pipeline without constant feeding? Though every situation is different, I’ll take a stand here and say that a healthy balance for most companies is a demand generation spend that comprises 60% lead nurturing and 40% lead generation. I also recognize that most B2B marketers reading this will likely say their ratio is more like Company B: 80% lead gen, 20% nurturing. But that’s because most B2B lead nurturing programs are basic in the extreme, and aren’t contributing to the pipeline at anywhere near the level they could. A demand generation plan that relies 80 percent on generating net new leads is a very expensive way to meet revenue goals. Companies with robust, sophisticated lead nurturing programs, programs tailored to persona, industry, and buyer behavior, stand to drive opportunities and deals at a much lower cost. This entry was posted in B2B Marketing, Campaign Planning, Campaign Strategy, Demand Generation, lead generation, Lead Management, Lead Nurturing and tagged b2b demand generation, demand generation budgets, demand generation planning, Lead Nurturing, lead nurturing budgets on December 14, 2012 by Howard Sewell.